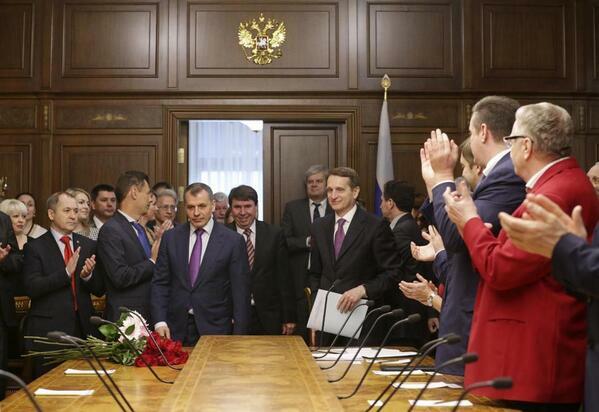 Standing ovations in Moscow today for Crimea separatist Prime Minister Sergey Aksionov. Russia appointed former gangster Sergey Aksionov Prime Minister of Crimea this week. Aksionov’s party won 4% of the vote in the last election. The new Crimean “Prime Minister” Sergey Aksionov was a local gangster in the 1990s. His nickname was “goblin”. His Russia Party won only 4 percent at the last elections in Crimea. Sergei Aksionov, a little known Crimean politician, was appointed prime minister of the peninsula by the regional parliament last week after armed men linked to Russia entered the parliament building. Aksionov declared March 2 as the “birthday” of an independent Crimean naval force, and said that almost all Ukrainian military bases on the peninsula had now come under the control of the “Autonomous Republic”. Putin’s puppet parliament in Crimea voted to join Russia on Thursday. The new Ukrainian government declared the referendum illegal and opened a criminal investigation against Crimean Prime Minister Sergei Askyonov.